Each of these macronutrients are composed of smaller functional units. Carbohydrates are chains of glucose and other sugars. 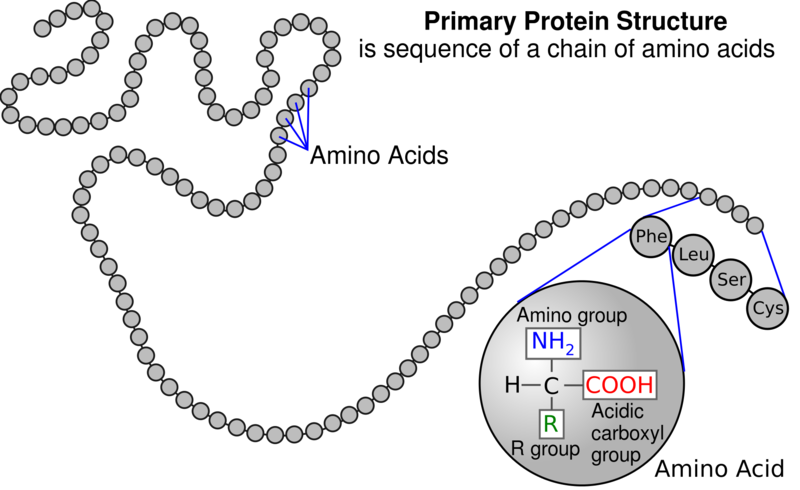 Proteins are chains of amino acids. Fats (triglycerides) are chains of fatty acids. There are also smaller, microscopic amounts of vitamins (A, B, C, D, E, K etc.) and minerals (iron, copper, selenium etc. ), known as micronutrients. Digestion breaks down macronutrients for absorption into the bloodstream. This provides both energy (calories) and the raw materials needed (proteins, fats) to build cells. Certain macronutrients must be obtained from our diet because we cannot make them ourselves. There are called essential amino acids (such as arginine and leucine) and essential fatty acids (such as omega 3 and omega 6 fats), but there are no essential carbohydrates. Without these essential nutrients, we would get sick. Each of the three macronutrients is metabolized differently. Carbohydrates, chains of sugars such as glucose and fructose are broken into individual sugars for absorption. Refined carbohydrates (eg. flour) are absorbed much more quickly into the blood stream than unrefined carbohydrates that may still contain significant amounts of proteins, fats and fibre. Dietary proteins are made up of components called amino acids and during digestion is broken down. These are circulated to the liver, where they are used to repairing and rebuilding cellular proteins. The first job of these amino acids is NOT for use as energy. These are used to build proteins like blood cells, bone, muscle, connective tissue, skin etc. However, if you eat excessive protein, the body has no way to store these extra amino acids. Instead, these are changed into glucose by the liver. An estimated 50-70% of the protein ingested is turned into glucose in an average North American person. Fat is composed of molecules called triglycerides. Digestion of fat requires bile which mixes and emulsifies the dietary fat so that it is more easily absorbed into the body. The fat is absorbed directly into the lymphatic system which then empties into the bloodstream. The triglycerides are taken up by the fat cells (adipocytes). Since dietary fat does not require the liver for initial processing, it does not require insulin as a signalling hormone. Thus, dietary fat has almost no effect on insulin levels. Dietary fat is absorbed more or less directly into our body fat directly. When you eat carbohydrates or proteins (in excess of body needs), insulin rises. All the cells of the body (liver, kidney, brain, heart, muscles etc.) help themselves to this all-you-can-eat glucose buffet. If some glucose is left over, it must be stored away. 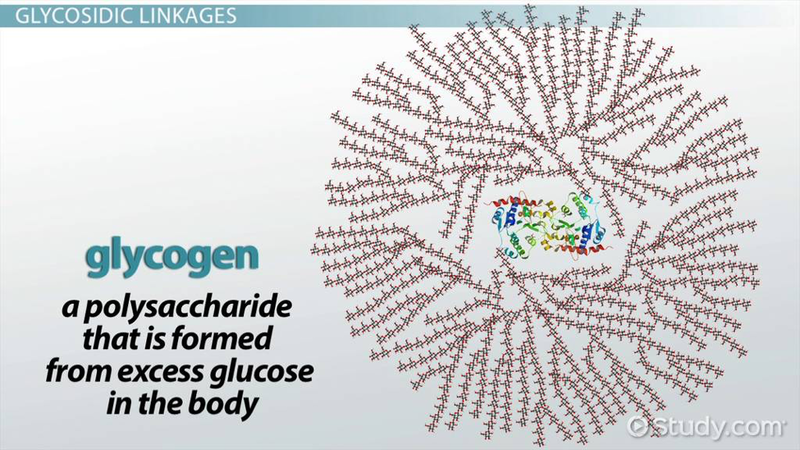 Individual glucose molecules are strung together into long chains called glycogen. This is a relatively simple process. The reverse process, breaking glycogen back into individual component glucose to provide energy when we are not eating (fasting) is also quite easy. Glycogen is both made and stored directly in the liver. When insulin goes up, the body stores food energy as glycogen. When insulin falls, as with fasting, the body breaks glycogen back down into glucose. Liver glycogen lasts approximately 24 hours without eating. Glycogen can only be used to store food energy from carbohydrates and proteins, not dietary fat, which is not processed in the liver, and does not break down into glucose. When glycogen stores are full, the body uses a second form of energy storage – body fat. Dietary fat and body fat are both composed of molecules called triglycerides. When we eat dietary fat, it is absorbed and sent directly into the bloodstream to be taken up by the adipocytes. The excess liver glucose that cannot be put into the full glycogen storage must be changed into triglycerides through a process called ‘de novo lipogenesis’. The liver creates new fat from this pool of excess glucose, but cannot store it. Fat should be stored in fat cells, not the liver. So, the liver exports out the fat as very low density lipoprotein (VLDL), which carries it to the adipocyte for long term storage. The liver essentially transforms excess glucose into fat and transport it to the adipocytes for long term storage. This is a much more laborious process than glycogen storage. The advantage of using body fat as storage of food energy is that there is no limit as to how much can be stored. These two different systems for storing food energy complement each other nicely. Glycogen is easy and convenient, but limited in storage space. Body fat is harder and inconvenient, but unlimited in storage space. Think of glycogen like a wallet. Cash is easily available, but there is limited storage space. Think of body fat like money in your bank. It is far more difficult to move money back and forth, but there is an unlimited amount of storage space. For regular daily activities, it is simpler to use your wallet. It is the better short-term solution. In the long term, however, we use a bank to hold your life’s savings. In the fasted state, when you don’t eat, insulin levels fall since food is the main stimulus to insulin. While the word fasting may sound scary, it only refers to any time you are not eating. It is the flip side or ‘B’ side of eating. You are either eating or fasting. When you sleep, for example, you are fasting. The word breakfast refers to the meal that breaks our fast, indicating that fasting is truly a part of everyday life. Our bodies only exist in one of two states – the fed state (insulin high) or the fasted state (insulin low). Our body is either storing food energy, or it is using it up. In the fasted state, we must rely on our stores of food energy to survive. High insulin tells our body to store energy. Low insulin signals our body to use the stored food energy, because no food in coming in. First, we break glycogen down into glucose for energy. This lasts approximately 24 hours. If we go longer without food, we will need to use the harder-to-access stores of food energy in body fat. If you use up the cash in your wallet, you will need to get the money in the harder-to-access bank account. A healthy body exists in a balance between feeding and fasting. Sometimes we store food energy (the fed state) and sometimes we burn it (the fasted state). It is hard to burn body fat, because it is naturally harder to gain access to. When insulin is high, your body wants to store food energy, not to burn it. Insulin blocks fat burning. High insulin tells us to make deposits into our ‘fat bank’. Low insulin tells us to make withdrawals from our ‘fat bank’. If you want to lose weight, you need to do two things. When making deposits, you want to make smaller deposits (eat lower insulin foods). This is the question of ‘what to eat’. Refined carbohydrates and sugar tend to cause the highest insulin levels. Therefore, reduce consumption of those foods. Second, you want to spend more time making withdrawals (spend more time in the fasted state). This is the question of ‘when to eat’. If you spend more time in the fasted state, then you will burn more stored food energy also known as body fat. All of weight loss comes down to these two things – what to eat, and when to eat. While we obsess about the first question, we almost ignore the second question. Is it better to eat 6 times a day, or once a day? If you eat 6 times a day, you are telling your body to store fat 6 times a day. That seems like a recipe for heartbreak. The magic combination of eating low insulin foods, which is virtually all natural unprocessed foods, and intermittent fasting (remember that fasting is a part of everyday life) is the best, simplest method of long term weight loss. Insulin is one of the key hormonal regulator of body weight. Obesity is a hormonal imbalance, not a caloric one. Simply put, insulin causes obesity, so reducing insulin is the main stepping stone for weight loss. The dangerously misguided focus on calories does not necessarily address the underlying hormonal imbalance. Need to correct last paragraph “Obesity is not a hormonal imbalance, not a caloric one.” I believe it should read Obesity is a hormonal imbalance. Last paragraph “Obesity is not a hormonal imbalance, not a caloric one.” I think this needs an edit. Obesity IS A hormonal imbalance…? This is a great blog to share with my new Keto converts! Thank you, Dr. Fung! Liver glycogen lasts approximately 24 hours even on a LCHF/keto diet? I was wondering the same thing. Does the 24 hours assume your liver is full of glycogen? To be in ketosis, liver glycogen would already be gone. I’m curious about this too – does vigorous exercise in a fasted state deplete glycogen stores faster? Vigorous as in weight training and/or high intensity intervals (not steady state cardio <60% VO2Max)? Glycogen is stored in two places – the liver and muscles. Liver glycogen can be ported anywhere in the body as it’s needed. Muscle glycogen stays put and is burned in the muscles where it resides. No doubt, the latter conserved by evolution – IOW, you may be hungry but otherwise willing and able to move to your advantage given the opportunity. I think in that last paragraph, it should say “Obesity is a hormonal imbalance, not a caloric one.” That is, remove the “not” in “Obesity is NOT a hormonal imbalance”. Great article! Quick question: is the last point supposed to say “obesity IS a hormonal balance not a caloric one”? “are full” should be “are low”. I think he’s talking about storage of excess energy. “are low” would be correct for the energy use end of things. “When [liver] glycogen stores are full, the body uses a second form of energy storage – body fat.” Is correct. How much fat should I eat? it is said that fat goes directly to the bloodstream, and then goes ito the fat tissue? How do we know we are eating too much fat to negate the desired fat loss? I understand, it is not recommended to count calories, but should we trust our hunger? should we let the fasting hours take care of itself? It says “storage” not usage. So, I take this to mean, when the liver fills up with glycogen, the next place it stores glycogen is as fat on the liver and then as fat in the cells. It’s talkinv about where the body puts the excess. Conversely, the opposite is true when burning and emptying. The body uses up the glycogen, then the liver fat, then the fat cells. What a disappointment this article is. Full of typos. But worse, it says that fat is taken up by fat cells directly so… it seems that if you eat fat, you get fat after all. What a mess. Wish this article could be clarified. Love your post…But only as an example of deflection and misdirection. It’s a mess?? If you eat fat you will get fat? It says that? Really?? Maybe you need to find another Forum to plant the anti-fat flag. The bottom line on most of this is that people need to reduce carbohydrate/sugar consumption AND (generally) stop eating more than twice a day. The only exceptions might be people engaged in vigorous work or athletics on an all-day basis. This all makes absolute sense. Thank you for your reply. You nailed down the most likely cause of my BG levels — cortisol and stress. It will be easier to reduce carbs than en stress, but I’ll really try. hard to do both. the post also needs clarifying regarding “excess” ingested protein and cites a link to an article from Journal Endocrinology. The First line in the abstract seems to suggest very differently from Dr Fung’s assertion regarding liver endogenous glucose production. Sir , doing intermittent fasting leads to acidity?? Can you please define. I am a Muslim, we fast in Ramadhan, from dawn to sunset. No food, no water. is that is what is fasting in your definition. or is it just avoidance non-sugar food and taking low quantity natural carbs. ? what what is intermittant fast. how many days we have to fast in a week. what exactly intermittant is in your definition.? pl. explain. With the phase of advancement in technologies, our manual interatction and physical involvement became less. Obesity is a severe disease that is rising with much faster rate. The impact if obesity will have been seen in the coming future. This article will really help everyone to know the bad impacts and proactively work on the cure for it. Apart from this, I also want to appericiate your writing skills. We really expect some more article on future coming diseases that will help us to work according on them.